Panasonic ready to unveil 150-inch plasma? 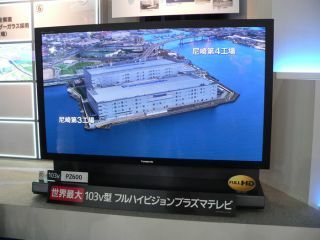 If you thought the 103-inch plasma was big, wait until you see Panasonic's 110-incher. According to a report in Japan's Daily Yomiuri, Panasonic is currently developing a 150-inch plasma display that it will claim is the world's largest screen. So far, there is very little known about the plasma other than that it's probably comprised of four smaller HD TVs that Panasonic currently sells. The report also claims that the TV's resolution should hit at least 1080p, but there is some speculation that it could be higher. Panasonic may be ready to unveil the set at the Consumer Electronics Show in early January, but production models will probably be made available in 2009.